The appropriately named Great Tank War app by Nate Games would be deemed boastful if it didn’t live up to its name; luckily for us, it manages just fine. Featuring historically accurate tanks and weapons–history buffs, eat your heart out–Great Tank War drops you into World War II action with nothing more than just a little ol’ U.S. Sherman tank. Controls for said tank are found on the lower corners of the screen: rotate your left thumb to drive the tank, and the right to fire. If you take your right thumb off the button, the tank fires its cannon. Each level starts with an objective, and sometimes a time constraint (usually they involve killing all the enemies you can, or defending something). On the upper left corner is the Frenzy gauge: once activated, your tank will be unstoppable for a short time. To fill the gauge, collect the stars on the field by rolling over them. Collect gold and coin in the same manner. 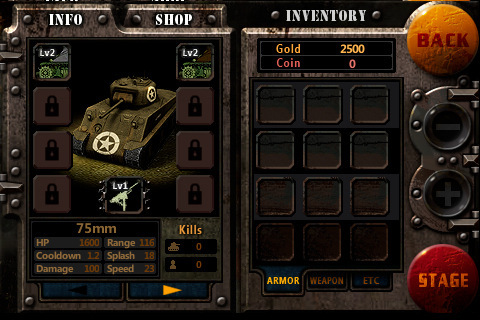 They can be used to upgrade your tank and its weaponry, which aren’t cheap; you also have the option to sell your inventory, if you’re short on cash. For quick and dirty payment, however, there are in-app purchases you can make to make your shopping experience a little easier. There are also five weapon types that you can unlock by reaching a certain number of kills: AFV 75mm cannon, Pounder Firefly, Flamethrower, Calliope and 105MM howitzer. The developers of Great Tank War obviously spent hours upon hours designing the look and feel of this game. 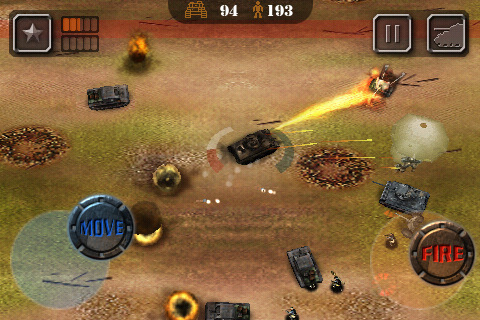 The controls are intuitive, and the 3D graphics are superb; war isn’t pretty, but this game app is. If this game were any more realistic, you’d be running and ducking for cover. Even the menus–fantastically gritty and full of gears–were meticulously designed. The soundtrack takes a bit of a backseat to the gameplay, but that’s all right: I’m having too much fun running over German soldiers on the field to pay attention (although I do love that drumline-inspired clip that plays when you’re in the menus). This isn’t a game that you can pick up to noodle around with and then put down…like a siege, it’s not easy and it’s going to take you a while to get through. I don’t know how long you can stand to drive around killing people, but Great Tank War could move you to do it. If you want an involved, meaty game, then this one is worth your $2.99. AppSafari review of Great Tank War was written by Julie Guan on September 13th, 2010 and categorized under Action, App Store, Games, Strategy. Page viewed 4397 times, 1 so far today. Need help on using these apps? Please read the Help Page.